Usually when we think of Edward I’s queen we think of Eleanor of Castile. However the grief-stricken widower married again. Initially he planned to marry Philip III’s daughter Blanche but she was married elsewhere to the Duke of Austria in fact. In her place, Philip IV offered the king his young half-sister Marguerite. Edward was so disgruntled about the loss of his potential bride that he went to war, or so the story goes. Five years later, following negotiations the sixty year old king married Marguerite. It’s more likely that the protracted negotiations had to do with who would hold Gascony. It was all that remained of the Angevin empire and Edward wished to keep hold of it but the French had other ideas. However, the couple finally tied the knot in 1299. There was a forty-year age difference. They were married in Canterbury and then Edward hurried back to Scotland to pursue his military campaign but not before Marguerite became pregnant. Her first child, Thomas, was born a year after her marriage in Brotherton in Yorkshire. Her desire to be loved and liked may have had some negative side effects though. The king gave her wardships worth £4000 so that she could pay her debts, a quarter of which seems to have been with an Italian cloth merchant….so a well-dressed lady. Whatever her methods she and her husband had a genuinely loving relationship and she steered a delicate course across the treacherous waters of Anglo-French relations which remained difficult during this period. When Edward died, Marguerite proclaimed “When Edward died, all men died for me.” She retreated to Marlborough Castle after the coronation of her step-son which was unfortunate. Her niece Isabella – to be known in history as the ‘she-wolf of France’ arrived in England as Edward III’s new bride and at that time the barely adolescent Isabella could have done with a bit of loving help from her diplomatic and much-loved aunt. 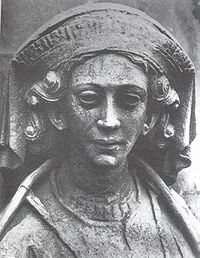 Marguerite died just ten years after her king. This entry was posted in Fourteenth Century, Queens of England, The Plantagenets, Thirteenth Century and tagged Brotherton, Edward I, Edward III, Isabella, Marguerite of france, Marlborough Castle, Philip III of France, Philip IV of France, She-wolf of France, The Pearl of France by JuliaH. Bookmark the permalink.